Wait until it is very dark. Rub the balloon on your hair to charge it up. Wave the charged part of the balloon back and forth near the light bulb... what happens? You should be able to see the light bulb lighting up as you move the balloon! However, if you keep the balloon still nothing will happen. The effect is easy to see with the human eye, but not quite bright enough for video cameras. We've been able to use an image intensifier to make this video, which is why it looks so 'night vision' green. An energy saving light bulb is made up of a glass tube filled with a low pressure gas. When you move the charged balloon near the bulb a current will flow in the gas - effectively a spark. 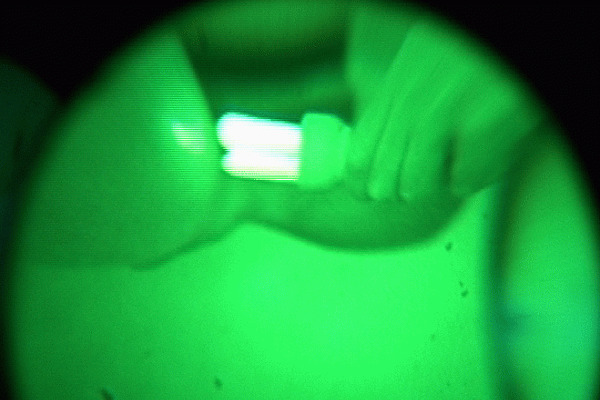 This gives the gas energy, which is converted into visible light by the white phosphor on the inside of the tube, which you can see. Why does a current flow in the gas? The gas in the light bulb contains some charged ions created when an electron is knocked off an atom randomly. If you move the negatively charged balloon near the bulb the positive ions will be attracted towards the balloon and the negative ones will be repelled. The bulb contains some charged ions naturally. When the balloon is placed near the bulb, positive ions move towards it an negative away. These moving ions can produce more ions. An ion will accelerate towards the balloon until it hits something. If it hits a gas molecule hard enough it can knock off an electron and create another two charged particles which will accelerate apart. When an ion hits a mercury atom it can transfer some energy to the electrons in the mercury atom. Unless this collides with another atom, the only way the electron can release this energy is to give off light. Mercury atoms tends to release light in the ultra-violet range of the spectrum. The inside of the tube is covered with several phosphors which will absorb ultra-violet light and re-emit the energy in colours that we can see, in exactly the same way that washing powder residue in your white shirt will absorb ultra violet light in a disco and glow a pale blue colour. Why do you only get light when the balloon is moving? You only get light given off when the ions in the gas are moving and colliding. So if you keep the balloon still all the negative charges will be still at one end and all the positive will be near the balloon but again no moving, so no light. If you remove the balloon again the positive and negative charges will attract one another and flow back again. If the balloon is still the charges redistribute themselves and then don't move When you remove the balloon the charges will attract one another again and so move again. Why do you sometimes get really bright sparks? If the balloon is really well charged up, sometimes a spark jumps from the balloon to the bulb, this makes a very large current flow and you get a much brighter light. How does the light bulb work normally? Energy saving light bulbs and fluorescent tubes (which this experiment should work on too) work in the same way, except that instead of waving a balloon to provide the electric field that moves the ions, we plug them in to the mains. Fluorescent tubes need special circuits to get them started because when you first switch them on there are not many ions available to carry the current. This means that initially you have to use a much higher voltage. This doesn't always work though, which is why they often flicker when you turn them on. Energy saving light bulbs have some electronics built in which do the same job in a more reliable way. Previous How you could drink your own urine safely?